Greetings from the weekend! How was yours? Mine was full of diapers, crying, and meeting the cutest baby ever. Also, news alert- babies are a lot of work. I feel like I need to redact all my moaning about how puppies are a lot of work because babies grow up to be human beings. You mess a baby up and the world has to deal with it. You mess up a dog and you have pee on your floor. Deep thoughts- that is what you come here for, right? Anyways, there will be a lot more on baby-mania later, but now I have a sweet running tool for you. I'm a big fan of the half marathon distance and have done almost a dozen over the past few years, but my times are stagnant (at best). My PR was actually my FIRST half marathon and I am itching to take a stab at beating that during my upcoming October half. I was chatting with Jill about our running goals (loosely used word) and she shared this INCREDIBLE running tool with me from Runners World. Instead of the more traditional programs I have followed where you slowly add more and more distance, this plan mixes up the lengths of your long run and sets time goals for you for each run. These times aren't ALL to run at your target pace, but mix it up. Previously I would scoff at my 'easy run' days or complain that my speed word runs weren't helping. This new plan will, hopefully, have me focus more on the actual run and the mini-goal for that workout. Instead of getting in my head about why my pace is stagnant, I think switching it up will be a great new tactic for livening up a familiar distance. Want to try it? 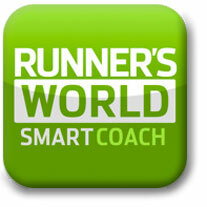 Click here to create your Smart Plan from Runner's World. To get started click create an account in the right hand corner. There are lots of upgrades that you can choose, but Im sticking with the free plan for now. The system will ask you about your current mileage and paces and then will generate a plan specifically for you! If you miss a workout or feel like you need to switch up the plan, you can easily adjust it. What do you use to track your fitness goals? This sounds like a great app! There's nothing more disappointing than training super hard for a race and your pace not increasing. Hope this helps you out!